Mock MMI Circuits Running In March! As the year wraps up, we would like to thank all of the consultants and physicians in our network. Our Fall Networking Event with guest speakers Dr. Joshua Liu, Dr. Arash Zohoor and Dr. Giancarlo McEvenue. 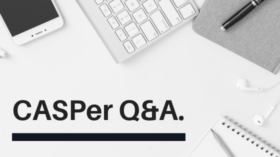 CASPer Q&A With Our Medical Student Consultant! Thank you to the University of Toronto and Faculty of Medicine for featuring one of the MD Consultants co-founders Dr. Jiayi Hu. You can find his flag in King’s College Circle outside of the Medical Sciences Building. Congratulations!